Starting your children early in their lives with good oral hygiene can help prevent the most common chronic childhood disease in America which is tooth decay. 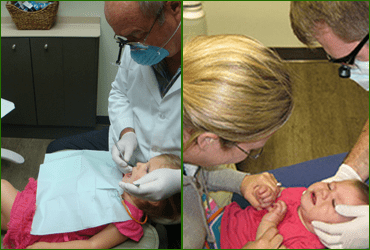 We welcome your child by age 1 or when their first tooth erupts for a “happy visit.” At this visit we lay them back in the chair or allow the child to sit in a parents lap and count their primary teeth and possibly try to polish if they let us. We answer all parents questions concerning their child and before they leave we let them pick a prize out of our treasure chest. We are trying to build a rapport with them and get them comfortable with us so they will know what to expect in future visits. Primary, or “baby” teeth, are important for many reasons. Not only do they help children speak clearly and chew naturally, they also aid in forming a path that permanent teeth can follow when they are ready to erupt. If a primary tooth is lost prematurely then a space maintainer would be needed to hold the natural space open for permanent teeth to erupt. Without a maintainer, the teeth can tilt toward the empty space and cause permanent teeth to come in crooked or not come in at all. When a child starts to get there first tooth, usually around 6 months, it is important to start keeping them clean with either a soft toothbrush or wet cloth. Tooth decay in infants can be minimized or totally prevented by not allowing sleeping infants to breast or bottle-feed. Infants that need a bottle to comfortably fall asleep should be given a water-filled bottle or a pacifier. Another way to prevent decay is to see if your water is fluoridated and if it isn’t then we need to discuss supplementing fluoride. We also recommend sealants, usually on permanent teeth, around the age 6 to protect the grooves of the teeth from food particles getting stuck in them and causing cavities. What to do if you knock out a tooth? If it is a baby tooth, do not reinsert the tooth and call us. If it is a permanent tooth, hold the tooth by the crown (not the root), rinse lightly with water only (DO NOT SCRUB) and reinsert the tooth in the socket. If it cannot be reinserted, put the tooth in cold milk, saliva or water and call us immediately.